1. What additional insights does FullContact for Gmail offer? 2. Does editing a contact in the FullContact for Gmail sync back to my FullContact account? 3. Where is FullContact getting details for my contacts in the extension? 4. How can I copy information in the FullContact for Gmail? 5. How do I change which contact is being displayed in FullContact for Gmail? 6. What can I search for in FullContact for Gmail? 7. How do I minimize FullContact for Gmail? 8. How do I remove FullContact for Gmail from my Chrome browser? 9. Is FullContact for Gmail available on other browsers? 10. How to remove Alpha / Beta version of FullContact for Gmail? What additional insights does FullContact for Gmail offer? If you’re a Gmail user, then FullContact for Gmail lets you gain additional insights to your contacts right inside of your Gmail window. But rather than just showing you information about your contacts, FullContact for Gmail lets you interact with them in other ways as well. Does editing a contact in the FullContact for Gmail sync back to my FullContact account? Yes, when you edit a contact in FullContact for Gmail the changes will sync back to your FullContact account. 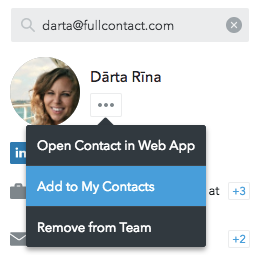 You'll see these changes in FullContact for Web and any other FullContact app you have downloaded. In addition, the changes you make will sync back to your Google Contacts account (and any other source you have syncing with your My Contacts). 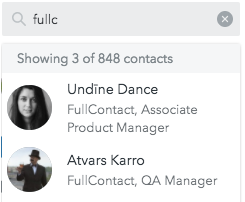 Where is FullContact getting details for my contacts in the extension? If you have a FullContact account, FullContact for Gmail is getting contact details from your account. If you do not have a FullContact account, our Person API is enriching your e-mail contacts with publicly available data. We'll add photos, name, title, social profiles and more to your contacts to get a full view of all your connections. You'll see this additional information displayed in Updates Available. How can I copy information in the FullContact for Gmail? We made it easy to copy information from a contact within FullContact for Gmail. Simply move your cursor over the information you would like to copy. To the right of the information, a small Clipboard icon will appear. Click on that Clipboard icon and it will copy the information to your Clipboard so you can paste it somewhere else. How do I change which contact is being displayed in FullContact for Gmail? 1. Navigate to the top of the extension and type a contact's name or e-mail address into the search bar. Select the contact you want to load. 2. Open a different e-mail thread. Wait for the corresponding contact's info to load in the dashboard. Otherwise, you can hover your cursor over the e-mail address and the contact's info will display. What can I search for in FullContact for Gmail? In FullContact for Gmail, you can search for a contact in your FullContact address book, as well all our entire database. To search a contact (that exists in your FullContact address book), simply navigate to the search bar at the top of the dashboard and search their name. You can search by first, last or partial name. When you have typed in your search, you can use the down arrow to go to a contact and hit the enter/return button. You can select a contact by clicking on it. To clear out your search, hit the small [x] icon found in the search bar. To search an email, put the full email in the search bar and hit enter/return. This will not only search your contacts but also the FullContact Person API for the contact. If they are in your contacts, you can navigate to their contact and a pencil icon will show up under the name; if they're not already in your FullContact address book/Google Contacts account, you can add the email address as a new contact. If the contact is in your team contacts but not in your personal contacts, you can tell by the presence of the Team & Known By insight. To add the Team contact to your personal contacts, click the "..." button and choose to add contact to My Contacts. If the contact is in your personal address book but not in your team contacts, you can tell by the presence of the Add Contact to Team button on the Team insight. Click it and the contact will be added to your team contacts. How do I minimize FullContact for Gmail? To minimize the FullContact for Gmail, navigate to the top right of your Gmail navigation and click the gray FullContact icon. You can open FullContact for Gmail by clicking the same icon. How do I remove FullContact for Gmail from my Chrome browser? Next, select the trash icon next to FullContact for Gmail, then click Save. Afterward, go ahead and quit your current Gmail window then reopen your page. Once you have done so, the extension will no longer display in your Gmail account. Is FullContact for Gmail available on other browsers? Unfortunately, at this time FullContact for Gmail is only available for Google Chrome. How to remove Alpha / Beta version of FullContact for Gmail? You can download the latest version of FullContact for Gmail here.